The Nautel C-Tech CTS-26 Sonar is a high resolution, active, Hull-Mounted Sonar (HMS) with narrow vertical and horizontal beams. The sonar is particularly effective in more challenging shallow coastal waters, as well as deep water applications. It is ideally suited for performing both ASW and Mine Detection missions in shallow water where extreme environmental conditions exist. It is also ideally suited for general underwater surveillance for coastal patrol activities, mine avoidance, search and recovery, Swimmer Delivery Vehicle (SDV), diver and swimmer detection, as well as ROV/AUV location and tracking. The Man Machine Interface (MMI)/Operator Console and processing software is provided by third party suppliers. These suppliers are working in partnership with Nautel C-Tech, to ensure ease of integration with installed Combat Systems and other sensors. 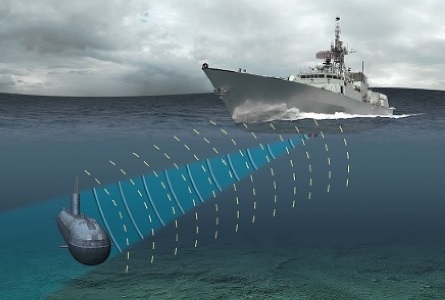 The CTS-26 incorporates the latest updates in Target Detection and tracking capabilities, including torpedo avoidance and wide band signal processing. Standard hardware interfaces are provided with established software and communications protocols.